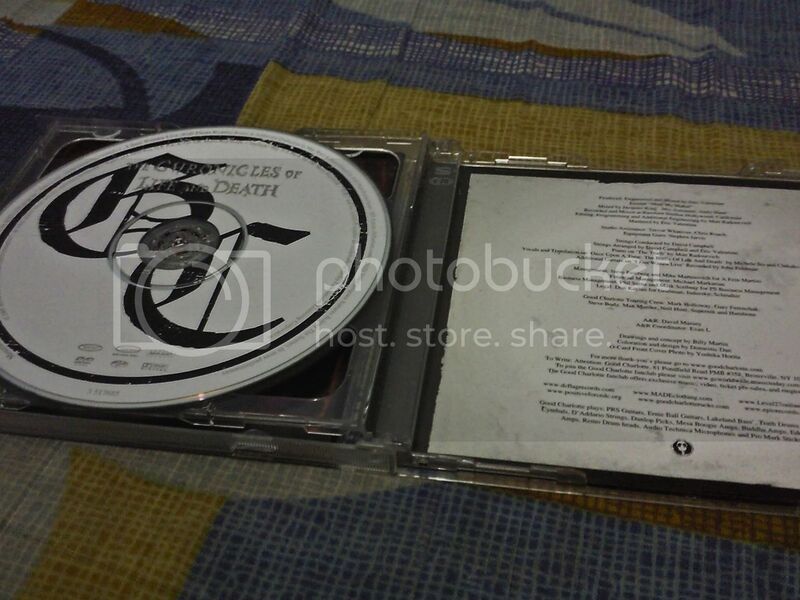 Even if the Speak Now DVD was launched earlier, here comes Journey to Fearless DVD by Taylor Swift. The DVD comes with more than 10 performances of Taylor Swift during her Fearless tour, as well as extra contents like digital photobook, behind-the-scenes and Taylor’s short biography. The DVD went on sale and launched by MCA and Oddysey on March 3, 2012, and that’s saturday so we’re there and joined the other swifties. The event took place in SM Megamall’s Oddysey branch and swifties (or Taylor’s fans) are all expecting great time that moment. Games and prizes are all in! Well it’s funny to say, but I pushed my girlfriend that day just to make her join the contest. Fortunately for us, she did won a Taylor Swift Notebook. By the way, The DVD came with a Taylor Swift stainless keychain as a freebie, as well as a Taylor Swift – Candie’s replica T-Shirt (if you pre-order The Hunger Games OST). So, Taylor Swift just finished invading the world singing “Sparks Fly” everywhere, and now it’s time for us to witness the tour in our own TVs! Now I present the Speak Now World Tour Album launching in Gateway Mall. My girlfriend and I decided to go and at around 10am, we were already there, waiting for the program to start. “First 200 gets the chance to win Taylor Swift premium merch”, that’s what’s in our minds that time, the reason why we came so early. 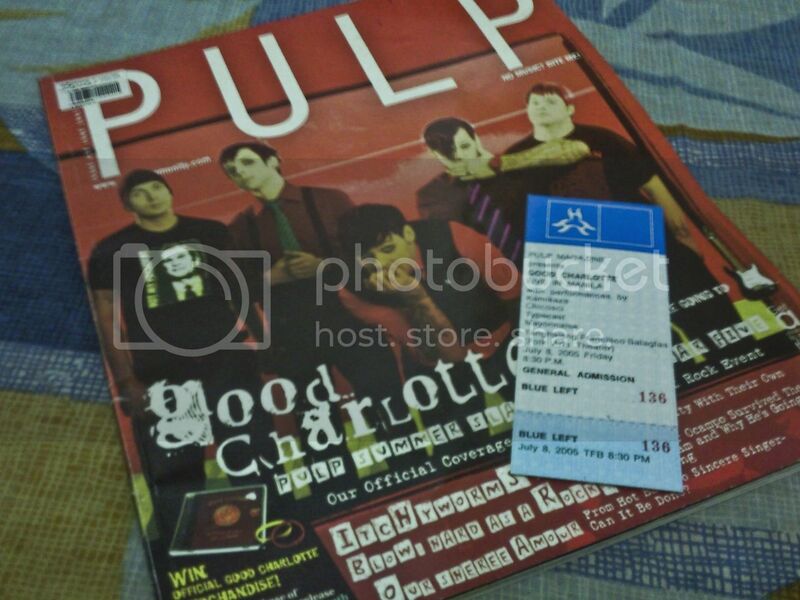 So we hurriedly grabbed a copy of the album and registered our name so we will have the chance to win. Luckily, we get the number 20. While waiting, we decided to take some pictures first to fight off boredom. Well, it looks like the show will start after lunch and it looks like we will have to wait for a couple of hours more! No worries. We ate first and came back until the show start off with Tricia Garcia as an opening act. Later, the Taylor Swift-wannabe contest started and we both fascinated by their awesome performances. Great Filipino talent, I should say. I almost forgot that we both had the chance to take a picture in a cool photo booth hosted by the event, as well as Cristina’s make over by the COVERGIRL team. Well I won’t exploit it but I caught her a video. 🙂 What matters to me is that, she was extremely looking gorgeous after that make over…promise! At 7PM, we came home and took pictures of the album and what we have won. I don’t really want to mention it but what we won is a Taylor Swift ballpen. Well, thanks to Covergirl, we took home 3 different Taylor Swift posters and a Covergirl Natureluxe Lip Balm. That day, I saw my girlfriend’s smile like it was everything to me. It’s so awesome to see her smile like that. I hope I can see it more often. 🙂 Thanks to the Lord for guiding us, by the way. After attending the launching of Mr. Taxi/Run Devil Run Run and Hoot albums in Odyssey, on my way I spotted an Intel booth. I decided to check it out coz’ I’ve seen the music video of Girls’ Generation’s Visual Dreams playing straight from Intel’s HDTV. There, a woman in white Intel T-shirt spoke to me and asked me to register, and if I do, I’ll get a free Intel fan. And so I did it. The woman also asked me if I can give them a minute to participate in an activity called “Director’s Cut”. She told me that all I have to do is to become a director for a minute by asking the Mime what to do. And again, no doubt, I did it. The time I finished directing the Mime, had a picture with him and they gave another freebie, which is a tumbler. (Good for me coz’ I am so depressed that time not receiving the SNSD tumbler freebie from GG Revolution). Thanks to Intel Philippines! Despite the windy and depressive dark sky and atmosphere because of Falcon, and my busy schedule, I still had the opportunity to buy the album and take part with the launching of Mr.Taxi/Run Devil Run and Hoot albums in Odyssey in SM Megamall. It was really worth the hassle. Freebies here and freebies there, so I decided to go and buy both. 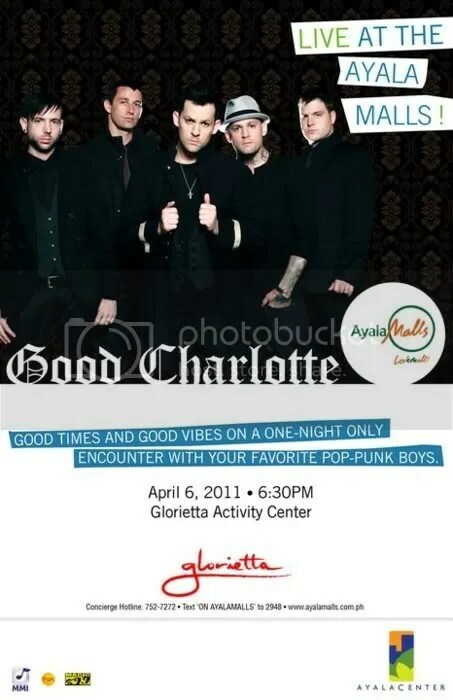 This day, I finally got my picture with Good Charlotte taken during their live performance here in Manila, in Glorietta‘s Activity Center in particular. I’m so happy. I came all theway from school after finishing some important papers related to my graduation, and decided to go to Picture City in Ayala MRT Station together with my best buddy, Conte. It’s way too hot to go outside but that is not a problem with me, as long as I’m with my best bud. We keep talking and talking until the end, that’s what I like about him. We came from a far away area, so far from Makati City, and getting this thing wasn’t a serious matter for some people, but I’m sorry, I’m a GC fan for a long time now. Last Wednesday there’s my favorite band Good Charlotte hitting the stage of Glorietta and having my opportunity to see them and shake hands with them in person. Now, we have my favorite South Korean girl group, Girls’ Generation, having their 1st Asia Tour concert album launched in various music stores. SM malls generally opens at 10AM so I came at that exact time and there, in SM North EDSA‘s The Block, Astroplus to be particular, SONEs and non-SONEs gather for the album launching. They also managed to have a public screening of some important video clips of the girls, including some fantaken videos from the said concert, as well as their music videos. For P550.00, you have your copy of Into The New World Live Album, a big-sized poster, a random SNSD fan, some K-Pop photocards and a chance to take photos with those gorgeous SNSD standees. Originally I managed to have a Sooyoung fan, however a guy asked me if we could trade and he has a Hyoyeon one. Well, it’s not that I do not love Sooyoung, I’m okay with anyone from our 9 angels. I was just trying to be friendly. Outside comes a mini-contest wherein you have to take a jump-shot picture for a chance to win all those SNSD fans. However, I’m feeling hungry, that’s why I went out and eat my lunch first. It’s so sad to go out alone. My older sister went with her highschool friends for an overnight swimming, that’s why no one can go with me. Sigh. Still, I keep on shopping a bit by myself. 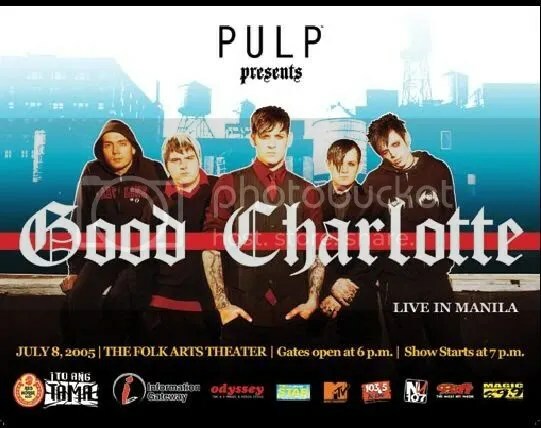 So just like what my earlier post said, it is now time for me to watch my all-time favorite band Good Charlotte hit the stage and sing all-night. It was a pleasure for me to see them in person. Firstly, thinking of how far my house is from the venue, it’s a bit tiring to go. However, we still went and we took an MRT ride in Quezon Ave. It took us almost an hour and we arrived at the Ayala MRT Station at 6PM, just in time to see the crowd, waiting to see GC perform. Near the entrance, there, you could buy their latest CD, Cardiology. 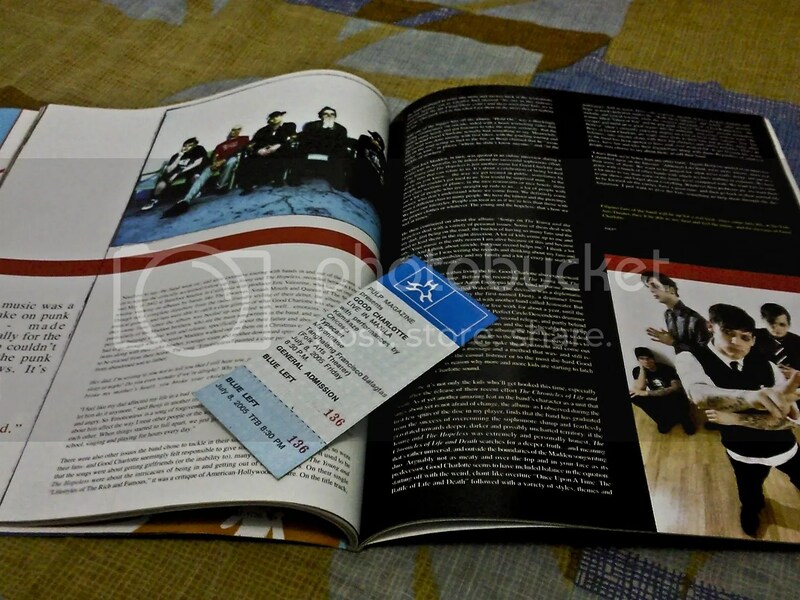 The problem is, we’re late to have the opportunity to see them while sitting in front. Instead, we’re just standing at the back, but satisfyingly enough to see them perform. And there’s that huge screen on top of Dean Butterworth’s drumset! Surprisingly, someone offered me to buy his ticket, for 250bucks. I did not deal with him, thinking of my older sister and brother. The show started finally at around 6:30PM and everyone have gone crazy. People I see are almost teenagers or college kids, but I was a bit surprised seeing some moms, some middle-aged men, etc. It’s variety! Good Charlotte took over the stage with the intro track from Cardiology, and then they followed it with their 2003 hit single, “The Anthem”. Basically, it’s a song for teenage kids to not follow the trend and waste life. A very good and meaningful song, that everyone enjoyed. The feeling was, like everyone’s jumping up and down, just like how the bass of the songs are. What’s really fun to see is how Good Charlotte perform with energy while everyone’s into the song, jumping up and down, singing their loudest and waving their arms. 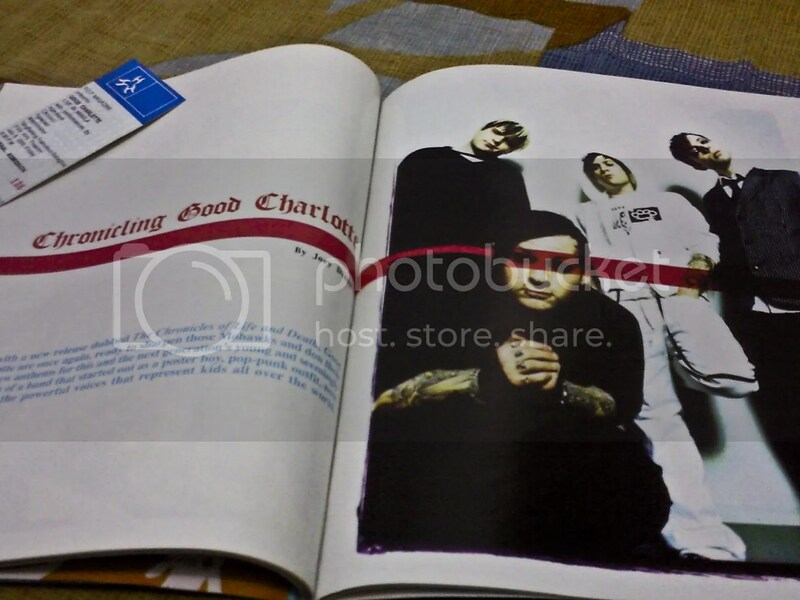 And everytime a song ends, the Madden brothers, like what they usually do, they keep on talking and telling some stories like their experience here in Manila and how they missed it after their last tour back in 2005. The Maddens is so funny when they say “Yeah, man!”, and then there’s that moment when Joel said “Mahal~ ko kayo”. My sister couldn’t forget that, specially before they sang Like It’s Her Birthday, when Benji said “everytime we come here in the Philippines, I feel like it’s my birthday!”. While the show continues, the three of us keeps on taking video, and to our surprise, MYX was there, doing some interview with our co-audiences. I’m not sure about this, but I guess we were also filmed, as the cameraman keep on taking video in our area. Me: You know what, we share the same birthday. Paul: Cool.. My daughter was also born on October 5.. Currently, this video playlist only includes videos I took, which is in a very bad quality. I’m gonna upload my sister’s and brother’s soon. 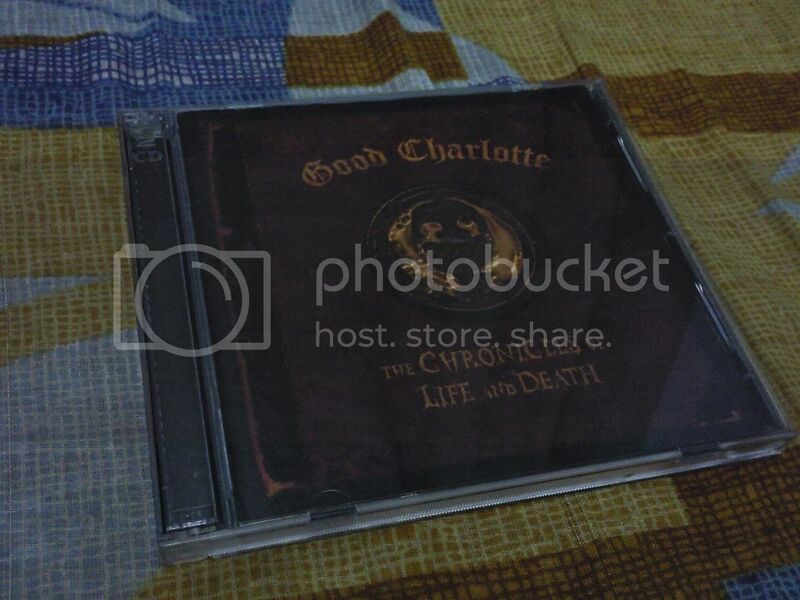 I heard about the news through Good Charlotte’s website, as well as a newly created Facebook eventpage only for the event. After knowing that my long-time idols are coming back to my country, all my hope rose suddenly. 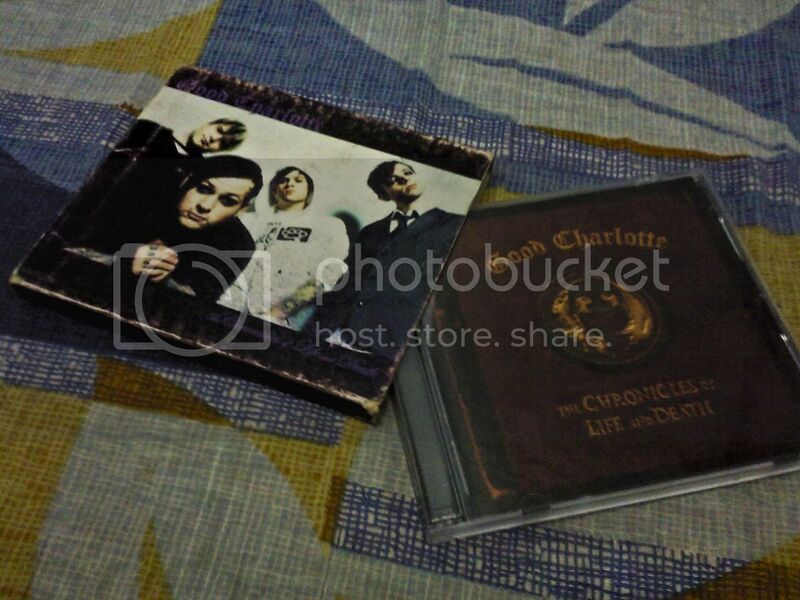 I started listening to Good Charlotte songs the time after my Dad passed away some months after my 13th birthday. 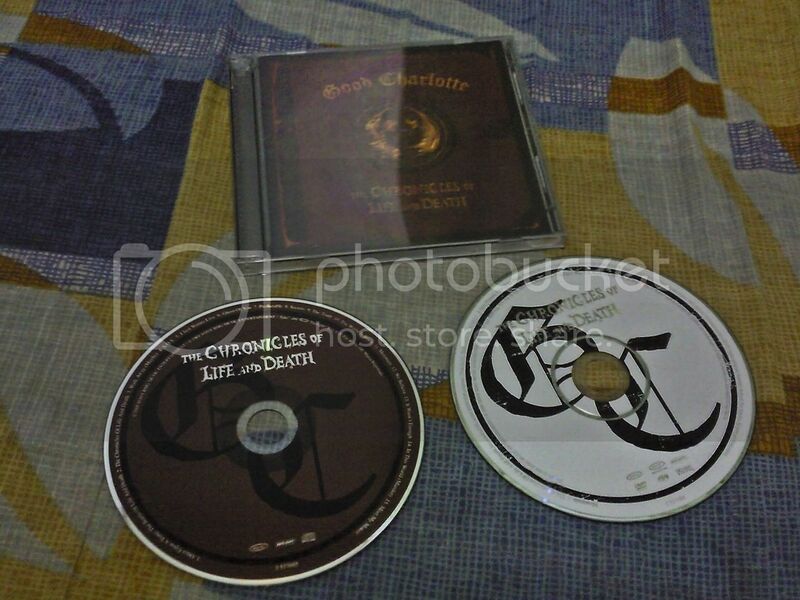 It was 2005 and the band is currently promoting their 3rd effort entitled “The Chronicles of Life and Death”, and their latest carrier single called “Predictable”. That time, I’m not yet into real heavy metal bands, but only those popular ones whose music videos are always viewable in either MTV or MYX. The Chronicles of Life and Death, basically it is a concept album about every person’s life after being born in this world, the opportunity to live gracefully, have annoying problems, have a family and die. That record really helped me a lot to understand why my Dad left us, me being the weakest among the three of us. I remember this song called “We Believe”. That song always make me remember my suffering back then, and how I coped up with my own teenage problems, with just a little advice from my family. Thinking of those times right now makes me feel stronger, saying that after all, “I made it”. The 3rd quarter of 2005 was an opportunity to for me to see these guys in person. 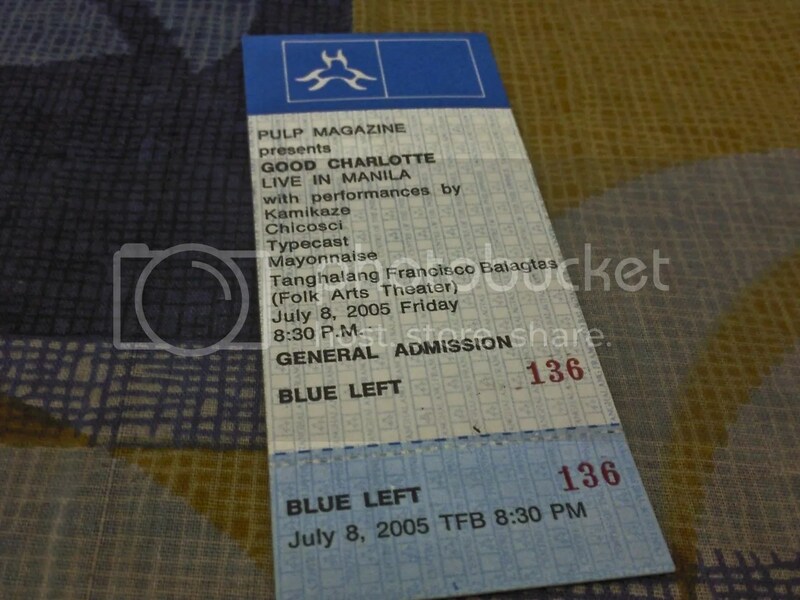 It was a concert of the band brought by Pulp Magazine. They’re gonna be here in my country to perform in Folk Arts Theater with some local bands like Chicosci, Kamikaze, etc on the 8th of July. In anyway, after all the years and my patience, even after those new great bands I learned, they are still my number one and now they’re going back to my country to sing. 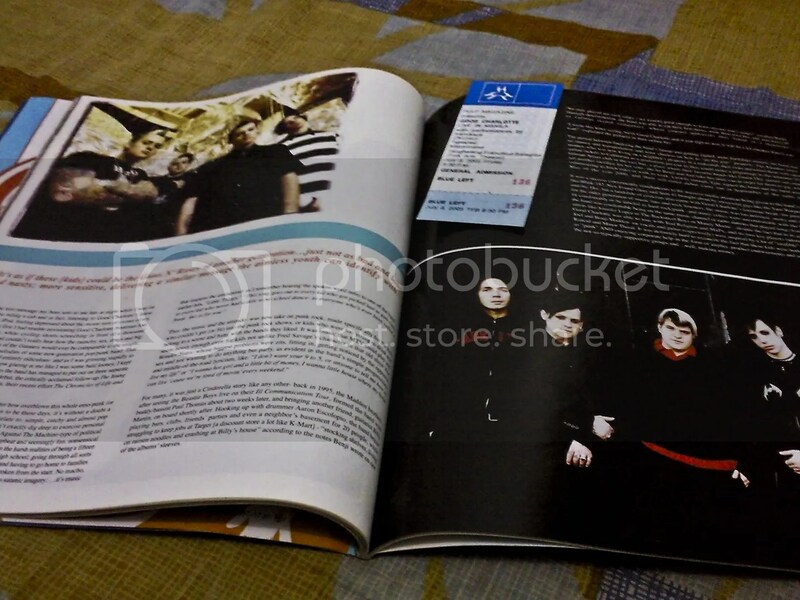 And this could be my opportunity to see them live, in my own eyes. 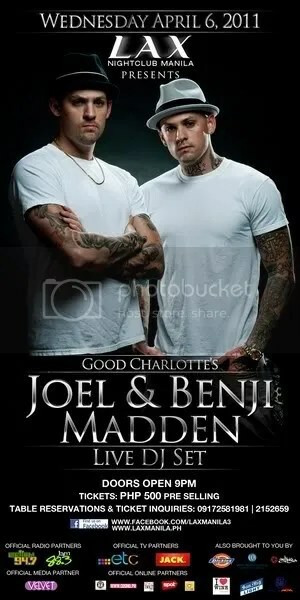 My opportunity to tell the Madden twins how much they’re like an idol to me, to tell Billy Martin how great he is now when doing those guitar solos, as well as Dean, and to tell Paul that we share the same birthday, October 5! Oh, and I heard in the news that our Benji will have a tattoo session here! Let’s find out on the 6th of April, 6PM in Glorietta Activity Center! This day, I’ve gone to SM North EDSA just to buy my very own copy of the Japanese versions of Gee and Genie. It was not just for Girls’ Generation fans, but also for BEAST as MCA/Universal Records are also launching the boys’ new album. I came around 10AM, just the moment the mall opened for that day. There, I saw BEAST and the girls’ picture-friendly standees, awaiting outside, just in front of the entrance of Astroplus. As expected, I saw lots of fanboys and fangirls out there, hanging out together. Sadly, I am alone, and I can’t stand it when everyone has their own company. I took some captures of the standees first. Man, it’s so embarrassing to take a solo pic of myself together with these pretty ladies’ standees, with everyone watching you at that moment T_T. I wish I invited someone, atleast my sister, so I have company. I find it hard to take photos of the girls’ standee. Everyone’s in there and I can’t get in easily. Anyway, at the back of BEAST’s standees, lots of SNSD calendar posters lies. Those will be given once you buy both single albums. Now that I’m home, I’ve checked both CDs, the poster and the 9 promotional cards. No, I did not open the CD, that’s a thing I will never do. 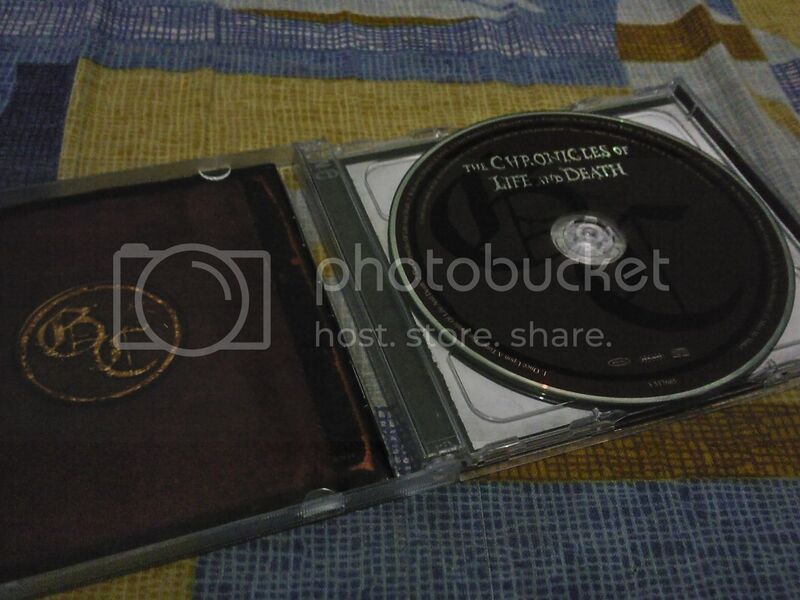 I find it useful to not open the CDs, even my older CDs are still sealed.